World Rhinoceros Day Pokes At A Serious Issue : The Two-Way On World Rhino Day, people across the globe celebrate the rhinoceros and raise awareness to save all five species. Rhinos stand at a water hole in Mkomazi rhino sanctuary on in Mkomazi, Tanzania. If you had a sudden urge to put a horn on your head, not use your knees and chew on some leaves, you may be catching the spirit of World Rhino Day. It's being celebrated all over the world with art shows, auctions, walk-a-thons and lectures with the theme of "Five Rhino Species Forever." The effort is to raise awareness for the threats posed to the rhinoceroses who are hunted for their horns, which are believed to have medicinal properties. The commemorative day is only in its second year, but it's caught on in zoos and conservation parks around the world. You can read all about some of the activities happening from San Diego to Hyderabad on the organization's website, worldrhinoday.org. Even without the prompting of an international day of awareness, the animal conservation group WWF recently organized three dozen religious leaders from nine African countries representing Christians, Muslims, Jews, Buddhists and Hindus to spread the word about rhinoceros conservation. 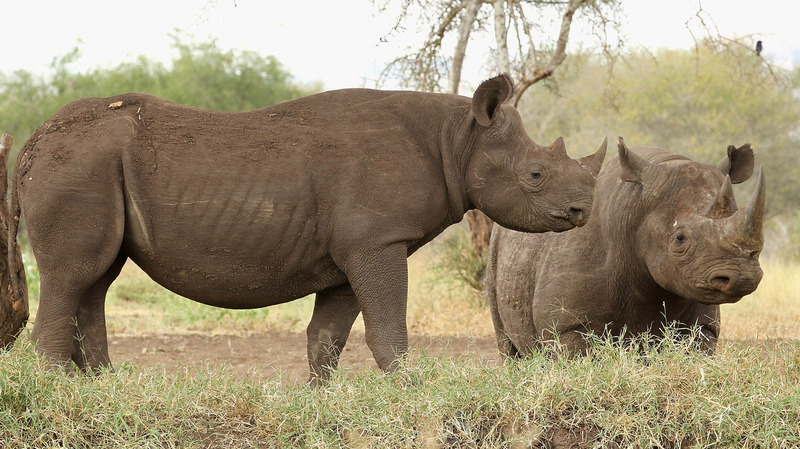 They toured Kenya's Nairobi National Park earlier this week where they learned more about the challenges facing the two African species of rhinos. The expectation is for the leaders to return to their congregations and speak out against the poaching of rhinos, as well as elephants who are slaughtered for their ivory tusks. According to the participants, the pairing makes perfect sense to the leaders involved, according to an AP article in the newspaper The Province. "The general message is that taking care of the wildlife is part and parcel with our religion," Hamza Mutunu, a Muslim leader from Tanzania said. "We have a duty from the Prophet Mohammed. ... Taking care of wildlife is within our religion." As it turns out, there has been some good news about the rhino population this week. A baby black rhinoceros was born at the Pittsburgh Zoo & PPG Aquarium on Sept. 13 — the first one born to that zoo in 47 years, according to the Pittsburgh Post-Gazette. In case you're wondering, it was no small feat for Mama Rhino, Azizi, to get pregnant in the first place. And once she was, it took 15 months before the new baby was born. The Fort Worth Zoo announced this week that its newest rhinoceros, a 5-week-old, one-horned rhino has officially been named "Asha" thanks to the votes of more than 3,300 Facebook fans. You can see pictures of baby Asha on the zoo's website. Correction at 1:40 p.m. ET, Sept. 24: We apologize for the "u" that got into the word "rhinoceros" in this post's original headline. The mistake is fixed.